that are undifferentiated or fully differentiated. disability as a consequence of nigral neuronal death . constitutes the first line of treatment for affected patients. 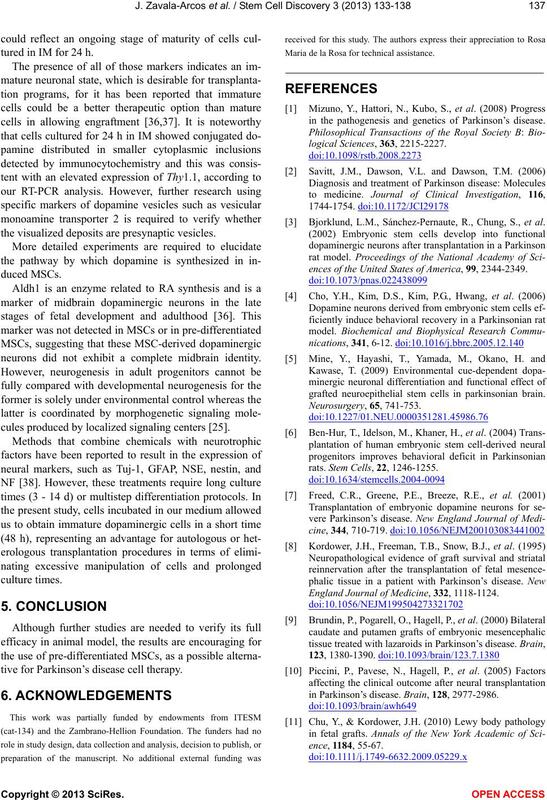 of transplanted cells survive [10-12]. they could be considered for clinical application. miner gi c neu rons [16,17]. light/dark cycle, with food and water ad libitum. μm pore size cell strainer (BD Falcon, Bedford, MA). ing 10% FBS and 1% antibiotics. replaced with induction medium (IM). protein (R& D Sy st ems, Minneapolis, MN ). cultured at a density of 1 × 105 cells/well for 2 or 24 h.
permeabilized using 0.3% Triton X-100 in PBS for 5 min. and are described on Table 1. Table 1. Primers used for RT-PCR gene detection. The GAPDH gene served as an internal control. 1 min at 72˚C) and 10 min at 72˚C for final extension. luminator (Di g iDocIt, Cambridge, UK). expression for nestin in the cytoplasm (Figure 1(C)). protein, even in MSCs incubated in CM (Figure 1(G)). cytoplasm vesicles (Figur e 2). Figure 2. 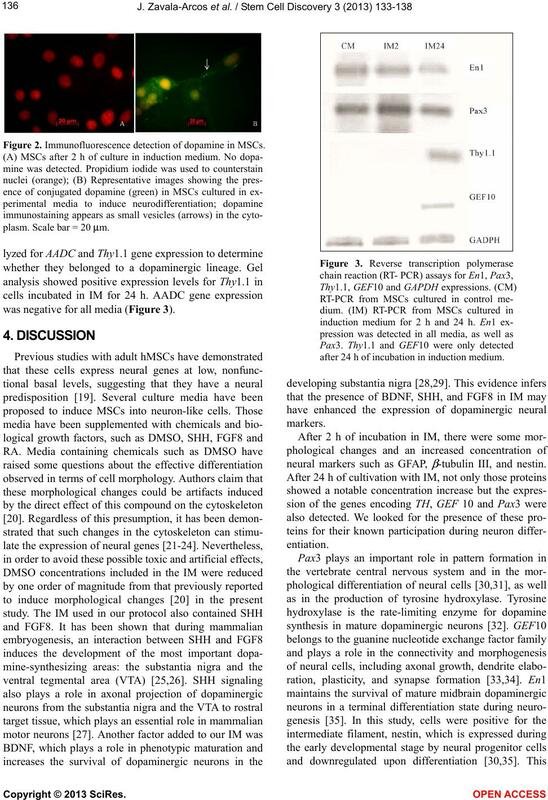 Immunofluorescence detection of dopamine in MSCs. plasm. Scale bar = 20 μm. was negative for all media (Figure 3). after 24 h of incubation in induction medium. tured in IM for 24 h.
the visualized deposits are presynaptic vesicles. neurons did not exhibit a complete midbrain identity. cules produced by localized signaling centers . 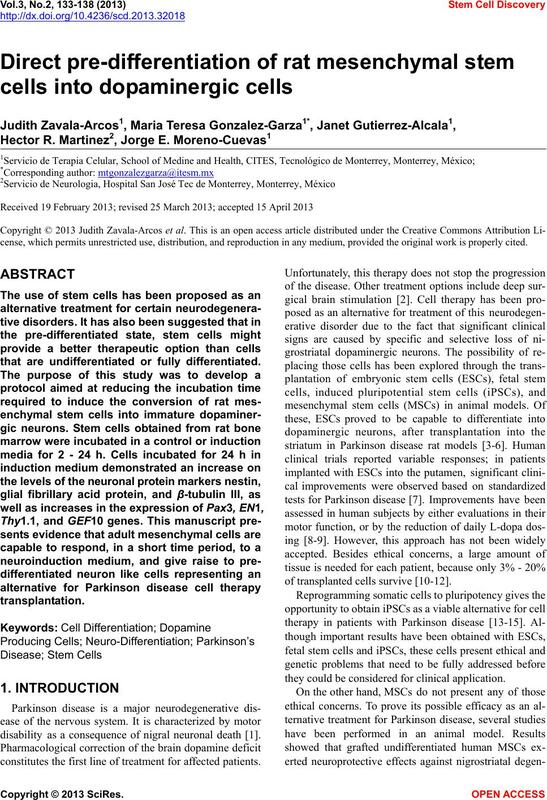 tive for Parkinson’s disease cell therapy. Maria de la Rosa for technical assistance. in the pathogenesis and genetics of Parkinson’s disease. Bjorklund, L.M., Sánchez-Pernaute, R., Chung, S., et al. 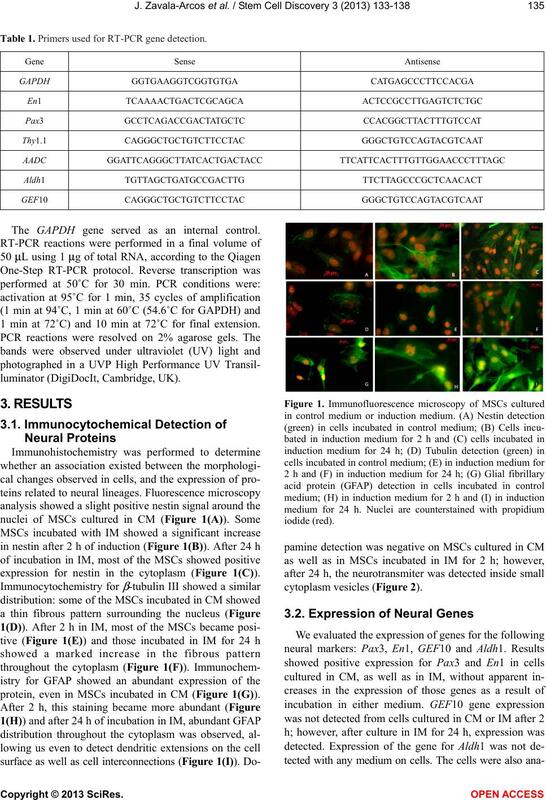 ences of the United States of America, 99, 2344-2349.
grafted neuroepithelial stem cells in parkinsonian brain. rats. Stem Cells, 22, 1246-1255. England Journal of Medicine, 332, 1118-1124.
in Parkinson’s disease. Brain, 128, 2977-2986.
conversion of human fibroblasts to dopaminergic neurons. United States of America, 108, 10343-10348.
icity in the rat. Cell Transplantation, 19, 203-217. Khoo, M.L., Tao, H., Meedeniya, A.C., Mackay-Sim, A.
parkinsonian rodents. PLoS One, 6, e19025. during in vitro culture: Considerations for cell therapy. ton. 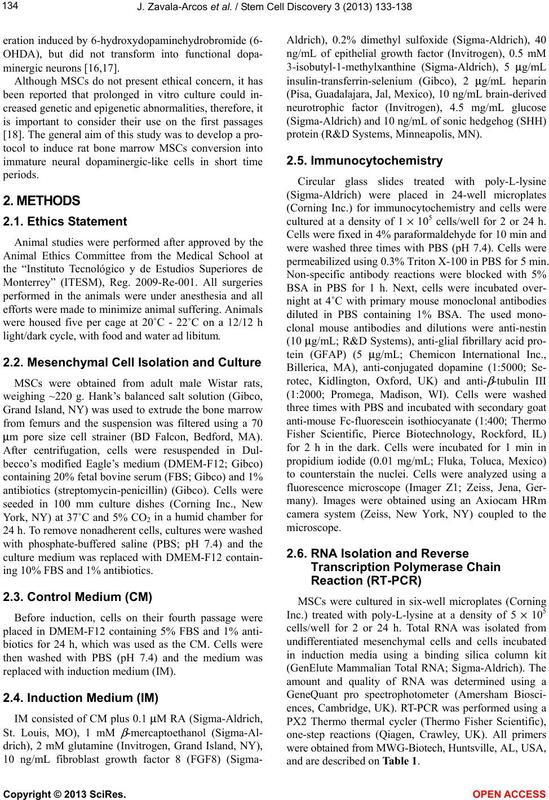 Journal of Biological Chemistry, 274, 12605-12610.
ron fate specification: Of mice and embryonic stem cells. axons. PLoS One, 4, e7007. stantia nigra. Nature, 350, 230-232. 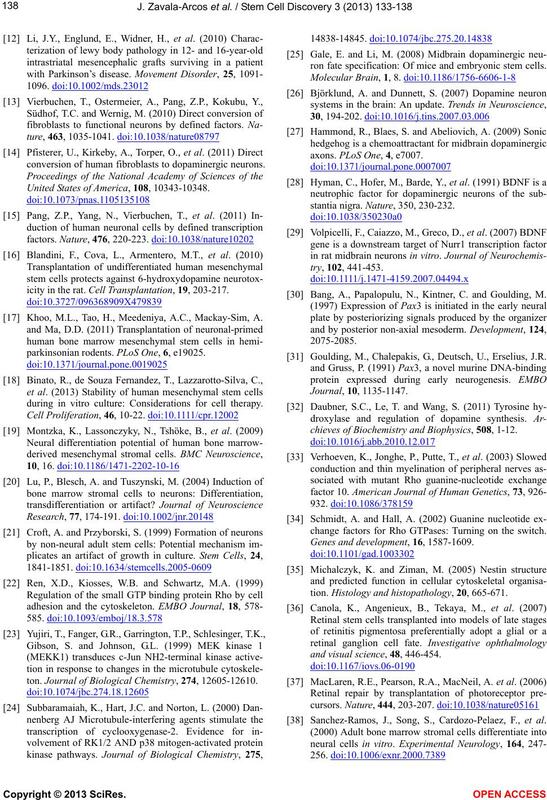 Bang, A., Papalopulu, N., Kintner, C. and Goulding, M.
 Goulding, M., Chalepakis, G., Deutsch, U., Erselius, J.R.
chieves of Biochemistry and Biophysics, 508, 1-12.
change factors for Rho GTPases: Turning on the switch. Genes and development, 16, 1587-1609.
tion. Histology and histopathology, 20, 665-671.
and visual science, 48, 446-454. Sanchez-Ramos, J., Song, S., Cardozo-Pelaez, F., et al.